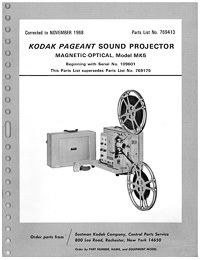 Kodascope MK-4 Pageant Sound Projector, Magnetic-Optical Service Manual Discounts Apply ! 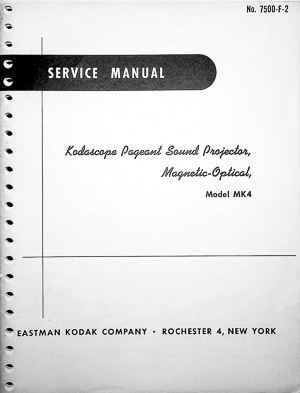 Excellent quality photocopy of the original 1958 Eastman Kodak Company Service Manual for the 16mm Kodascope Pageant Sound Projector, Magnetic-Optical, Model MK-4. 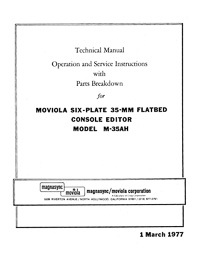 This 48 page manual is printed on double sided 8-1/2" x 11" heavy weight paper. It has a card stock cover and is plastic comb bound so it will lay flat on the workbench. 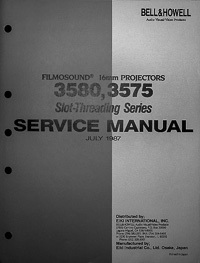 The heavily illustrated service manual contains sections on service hints and troubleshooting, lubrication charts, special tools, disassembly, reassembly, sound adjustments, amplifier schematic, and playback schematic circuits.